The Heavy Personal Price of conflict zone photography and Moving on…. I have done a lot of blogging in the past about photojournalism, war-type photography and how it just doesn’t work as a business model. I haven’t said too much though about the personal effect it has had on me and how I have felt undertaking such photography. I remember when I did my postgrad at LCC in London, on the first day of the course we were asked if anyone would want to be a war photographer… I remember my hand going straight up and talking about what I then thought were the merits of doing such work. I got into photojournalism mainly on the back of being in awe of greats such as Don McCullin, Capa and Lee Miller. I would have given anything at the time to have been able in an ever so small manner to be able to walk in their great footsteps and achieve even a miniscule portion of what they had. What I came to realise later on though is that things had changed so much than what they were back then for photojournalists. In the past there were far fewer photographers doing such work and when magazines such as LIFE were in their hey-dey, such photographers were truly witnesses to the world for the rest – on an altruistic mission to reveal what was going on at great personal risk to themselves. Today though (and for the past 30 years) there are so many conflict photographers out there. The editor of a large European magazine once told us that during the Libyan conflict she was inundated with so many emails from freelancers simply stating they were on location and if she required any pics for the mag. When there are so many of us – and now of course with the advent of citizen journalism – conflict photography, in my opinion, begins to lose that one altruistic justification – of being a true witness for the rest – that made it viable to run around conflict areas. When it just becomes a desperate race to beat the competition to the action in my humble opinion it becomes no better than paparazzi photography. 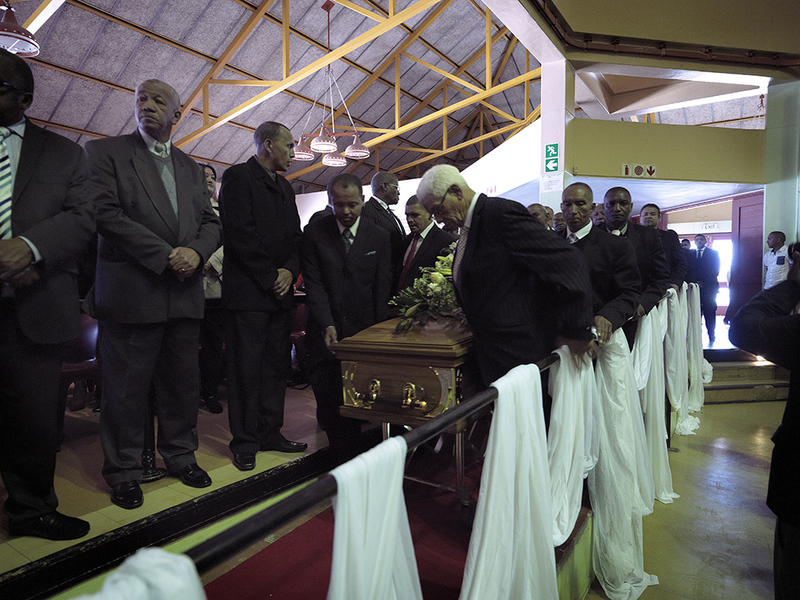 I was at a funeral a few Sundays back taking shots for my Hangberg book project. Around the open coffin there were standing young family members of the deceased, completely inconsolable. For a second my old instinct came through and I thought what a powerful picture that would make. But in the same instance I couldn’t bring myself to take any photos. I found myself instead really empathising and I was quickly overwhelmed with emotion. I stood there and just observed. It suddenly struck me how much I had changed as a person as well. In the past, I wouldn’t of hesitated to take that type of photo. I suddenly wanted to apologise for every time I had stuck a camera in the faces of other people’s misery. This might be a tad epic and overblown – but it was real to me and I had to hastily leave the funeral cos I could hardly breathe. I began to question what had I truly risked so much for really – and the trauma of the things I had seen have taken a very heavy personal toll – a nightmare from which I have only recently been able to escape. I had a conversation a few months back with an ex-British soldier. We were comparing stories and discussing the trauma the things we had seen had caused us. After an hour I came to the conclusion that the difference between us was not what we had seen – but in a strange way – I felt more traumatised because I had been inactive in all the situations I had been in whereas a soldier is active and involved. I felt I had to carry the shame of ultimately running around a conflict area for the simple purpose of trying to get my pics in publications and on the wires. Some might say these feelings are misplaced – but it is truly what I feel and it has been my own personal experience of such work. I can honestly say I will never again go to a conflict zone to photograph and take such pics. That time of my life is over and gone.